Why I read this book: This series is my favorite YA series at the moment. So freaking good! It's been a long time since I read a really long book in a day. Thinking back on it, the last one I did was the previous book in this series, Scarlet. But really I have not wanted to read more of a YA series this bad since Harry Potter. The Lunar Chronicles are just so freaking interesting, imaginative, and full of things that keep you wanting to turn pages. I have yet to be disappointed by any of them. Cress is the third book in the planned quartet. Following with tradition, Cress is a retelling of a beloved fairy tale. We've had Cinderella (Cinder), Red Riding Hood (Scarlet) and now we have Rapunzel. My favorite part of these stories is how she takes the elements of the original story and makes them her own while keeping them familiar. The plot picks up where the last one left off and we meet Cress, held captive on a satellite orbiting the Earth, forced to spy on the Earthens for the Lunars (people of the moon). She has been helping Cinder and crew and I guess we briefly met her in the other books but I couldn't remember much about her. She tries to help Cinder et all but things go down and she ends up on Earth with the object of her infatuation, Captain Thorne. Thorne we met in the last book, and his characterization remains pretty consistent which was nice. He is still sarcastic, mildly selfish and entertaining as hell. I don't want to say too much about the plot because a) it's spoilers for the last book and b) it's kind of all over the place (in a good way). 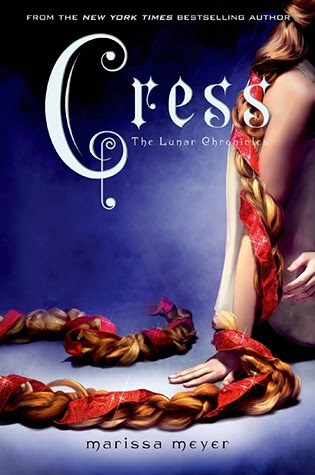 Cress isn't a book that is primarily focused on the titular lady which is different from Cinder and Scarlet. Scarlet I think was still primarily about Scarlet even though we still saw some things going on with Cinder. Cress though we may see more of Cinder than we do of Cress. And to be honest, Cress is kind of boring. Cinder is really the heroine of this story still. I enjoyed Cress' time on screen (on page?) well enough I guess, but the real story I wanted to read about was still Cinder's. One thing I do appreciate is that Cress has her own characterization that is different then both Scarlet and Cinder. There is not cookie cutter heroines here. They are all pretty individual. Cress is shy and social awkward, which makes a ton of sense considering she has spent 7 years alone on a satellite. The reason why this is rated a bit less than the other two is that there was a point about half way through when I thought, "What has really happened so far?" I could think of two or three really important things, and the rest was just supportive fluff. Maybe it was a necessary thing to set up things for the climax of this book and maybe some things for the next book, but I still thought it. Right after I thought that the story picked up again and didn't slow down until the end. Overall I love the hell out of this series. I adore how she weaves in the elements from the original stories and pulls no punches. I can't wait to see how the series wraps up. The next one, Winter, is Snow White. I can't wait to get my hands on it. If you are looking for an imaginative fantasy/sci fi YA novel that really grips you and doesn't let go, this is it. Cinder and Scarlet are a must read before this one though. THANK YOU for mentioning who Winter is supposed to be based off of - none of the other reviews I've read have addressed that at all. I can't wait to see how Meyer incorporates that story; she's done such a good job (like you said) with taking the basics of the fairytales and turning it into something hugely imaginative. Can wait to read it!!! I am in dire need of a new YA series, so thank you so much for the suggestion. I just read Cinder, and I loved it. I can't wait to continue with this series!